I teach my clients to strengthen both their mind and body for optimal energy, health, and happiness. I deliver wholeness. Scott Alexander is passionate about developing the UK’s health & fitness industry, and addressing the way in which people approach their fitness regimes so that they begin to move away from carbohydrates and position their bodies into a state of "fat adaption" (RQ 0.7) so that the body will run at optimal electing "fat" as its preferred energy source, hence stabilising insulin and decreasing body fat both safely and naturally. 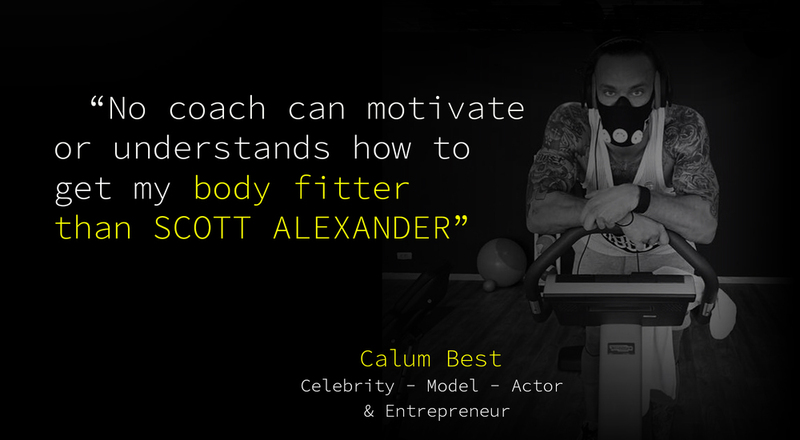 Through his innovative and energetic training methodology, lifestyle transformation approach, and inspirational voice, Scott Alexander reaches out to educate, motivate, and empower not just his clients, but also any of the wider population who want to succeed in this area. Scott’s message says that you too can achieve the body YOU want and empower yourself to believe this. At the core of his approach is fat loss and body sculpting achievement through fitness, or as he likes to put it "Stronger Heart, Stronger You....."
Scott Alexander is a featured "fitness expert" in Mens Health. I remove all client self-doubt.' He continues 'The science of what I do is proven, and I motivate through empowerment. When I coach on the gym floor I do so with confidence, because I know my client’s body, I have assessed exactly all baseline fitness markers, thereby knowing both the physiological and psychological limitations of each and every client, I will push you right to the edge of your fitness capacity not with guesswork but with smart, safe, monitored and proven training methodology to get you over that finish line. "I don't buy excuses, I demand you earn results." Scott Alexander has developed the training logic behind the worlds most advanced fitness App " Your CardioGuru"
Scott is considered to be a leading expert and master trainer on HIIT, VO2 Max and FATMax Cardio training protocols and a "targeted heart rate training specialist " the building blocks of his HighVoltBody platform. Follow Scott’s proven methods and attain the previously unattainable. Going into more detail about his method, Scott explains 'My methodology is based on client empowerment and knowledge. We are all so very different, and it is my job as a coach to fully understand and embrace every client’s uniqueness. I teach my clients to strengthen both their mind and body for optimal energy, health, and happiness. I deliver wholeness.' The mind needs conditioning,' he emphasises. Although Scott is a firm believer in the hard work beginning before a client even puts a foot in the gym, that doesn't mean he doesn't know a thing or two about hard graft. Over 20 years of training, he has never gone over 6% body fat, sticking to his own regimes of fat adaption, fasted cardio and HIIT, in which he specialises. Centering his methodology upon VO2R, a calculation of exercise intensity, Scott will not touch a client until they have completed his full day "Prepare2Win Program" which involves assessing his clients' baseline fitness, using a range of high tech monitoring equipment, such as ECG heart rate monitors, bespoke screening software and fitness tests carried out on the Wattbike, all to help get a picture of overall health and fitness so that he can set realistic targets and plans. 'My clients will spend the day with me at either my bespoke facility or a global location and receive expert tuition on the key factors that will form "the life changing decision" to action change. A client must "believe in this process, and for that they must fully understand and have input. A real decision is not "lets try it and see". The word decision derives from Latin "to cut off from all possibilities of the past and commit to the future". Already a leading industry figure, Scott has also turned his hand to more business-minded matters within the sector, saying 'Most fitness professionals get frustrated with an industry that has grown so fast it has neglected to address many of the basics, thus it continues to fail in the key area of helping the public at large get fit and healthy. I see confusion daily, and many problem areas, but the one repeated wrong that I cannot stand still on is the subject of cardio/HIIT.' Deciding to take action, 24 months ago Scott founded fitness software HighVoltBody and The Cardio Guru, aiming to be the 'world’s most adaptive, responsive and efficient fitness app and the biggest resource of free information, workouts science, experts on all matters cardio and HIIT. Scott says 'The real benefits of cardio and HIIT training happen when the right training/diet information meet motivation." 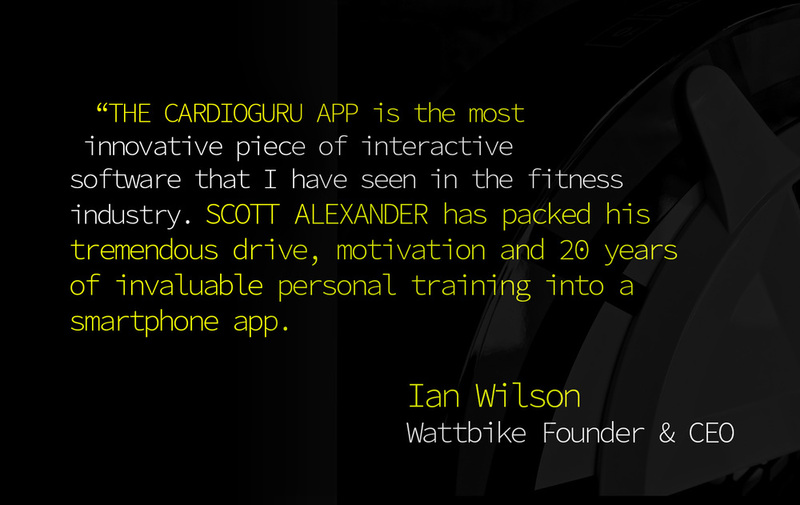 Teaming up with big brands such as Wattbike and Bio-Synergy, Scott hopes to launch several fitness app platforms this year. 'It has been the hardest venture of my career, but one in which I have learnt so much and met some truly amazing people,' he admitted. 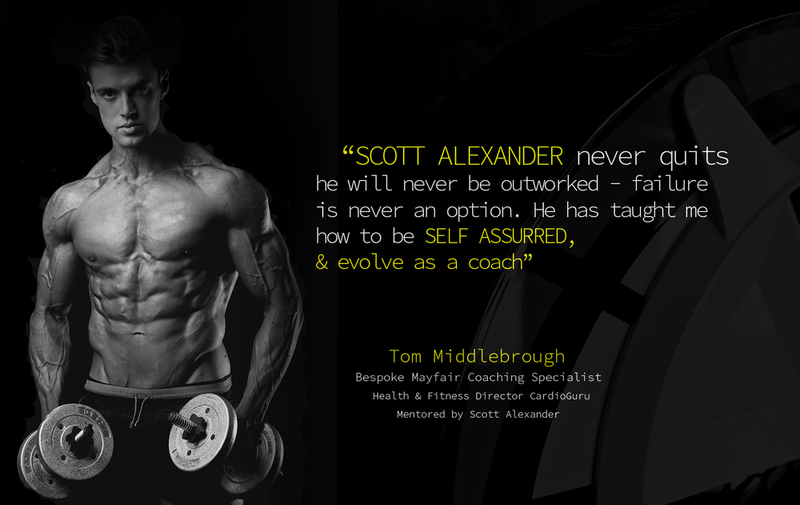 Scott also uses his technological advancements to aid his personal training, with his unique remote coaching working alongside face to face meetings. 'Each day, through software I’ve developed, they get live feeds of what, where, and when they are eating and training. The software responds as quickly as their day changes. I have a mental connection with my clients 24/7 which weakens as they gain in knowledge.